85, 1 p., 6 leaves of plates : ill. ; 25 cm. by Mrs. J.W. 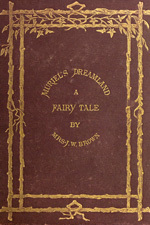 Brown ; with illustrations by the authoress and her daughter, Alberta Brown. Illustrations are pasted on photographs of drawings. Preservation and Access for American and British Children's Literature, 1870-1889 (NEH PA-50860-00). This page contains no text. MURIEL'S DREAMLAND:jT Fairp Jpalr;BYMRS. J. W. BROWN, M.S.F.A.,WITHILLUSTRATIONS BY THE AUTHORESS AND HER DAUGHTER,ALBERTA BROWN.GRIFFITH AND FARRAN,SUCCESSORS TO NEWBERY AND HARRIS,ST. PAUL'S CHURCHYARD, LONDON.MDCCCLXXI. LONDON:PRINTED BY RANKEN AND CO., DRURY HOUSE,ST. MARY-LE-STRAND, V(.C. MURIEL'S DREAMLAND. 15although the dreadful sounds which pro-ceeded from it might have guided him,for the noise was deafening: cries, shouts,screams, in every tone of agony, wereheard there; and, as he staggered on,large stones rolled before him, many ofthem striking and bruising him, andGoldencrest was almost distracted beforehe emerged from the cavern. But hestill hastened on, and soon the entranceto the Silver Fountain came in view.In strong light, which appeared moredazzling from the late darkness, stoodtwo massive silver gates, rising high intothe sky. On one side hung a silverhorn. Rocks of brilliant colours enclosede. THE SPIRIT CF THE FOUNTAIN. MURIEL'S DREAMLAND. 2 3come back to your little Willie!" Hedashed his head upon the floor, andsobbed so violently, that the tender heartof Silverbelle was melted, and she de-termined to pause here, and ease thesorrows of this poor little mortal.Waving her wings over him with asoothing motion, until he became morecomposed, she went to discover the cause'of his affliction, which she soon learnedfrom the servants, who were feastingbelow regardless of his trouble-for theSprites had been at work in that house,showering black rain upon all, chillinghearts which should at least have beenwarm on that day. MURIEL'S DREAMLAND. 31when a heavy weight had fallen upon herhead, and left her insensible. She hadremained in that state since, and theybegan to despair of her ever recoveringher reason. After giving her sick childsome broth, the mother busied herselfabout preparing the dinner, setting eachof the children to do something; evenlittle Willie was put on a stool by thefire to watch that the meat did not burn.At length the grand meal was prepared;all noisily took their places round thetable. The highest chair was chosen forWillie, to make him look more important;and his pretty chubby face and arms, and-soft wavy hair, were duly admired by therough, yet generous, children around. 44 MURIEL'S DREAMLAND.was raised to strike, and the terrible knifegleamed in the air, when Goldencrest,faint and exhausted, with a last effort,dashed the Fairy bottle with all his forceacross the room. The whole of its con-tents fell full in the face of Stephen. Likelightning the knife dropped from his hand,and, with a wild look, he cried, "Am Imad? Oh, father! oh, mother !" andrushed with frantic haste from the house.The Sprites gave a long howl of rageand disappointment, which fell upon theears of the sleeping men like the roarof a tempest, some of whom raised theirheads for a moment, and muttered, " Whata terrible storm." tMURIEL'S DREAMLAND. 47he became a selfish, passionate man, andwas then led into bad company, where hes6on learned to drink and gamble, whilehis heartbroken parents had no power torestrain him. Thus he went on frombad to worse, in idleness and sin, untilthe mild temper of his father was rousedagainst him, and frequent quarrels arose.One night the old man, tried beyond allendurance, forbade him the house, andtold him never to return until he couldcome in a humble spirit, asking forgive-ness. Then the son, laughing loudly,declared that never should he be broughtso low; and heedless of his mother'stears and entreaties, he dashed from thehouse. ... '.14\~~~~ ,: i .. lll 6i..... ..... .! OTH.ERLESS. "MURIEL'S DREAMLAND. 57terrible tidings. For a few weeks shesat silently by the window looking outupon the sea, a little needlework in herhand, too heartbroken to do much; fromtime to time lifting her weary head towatch the rolling waves, frequently heav-ing deep sighs, especially when vesselsarrived. The eldest girl nursed herquietly and tenderly, taking charge en-tirely of the baby; but she droopedrapidly; and one evening, when the littlenurse came home, the usual wan smileof greeting was not given, and, hasten-ing to her mother's side, she found hereyes still fixed upon the broad ocean, butall her sorrows at an end, and only thedesolate children were now to be pitied. 58 MURIEL'S DREAMLAND.The brave-hearted child struggled againsther own grief, knowing that she alonemust support them both for the future.Who shall tell of the fears that dailymade that young heart tremble as eachmorning she left the dreary place shecalled home, uncertain whether the fewpence necessary for existence would beearned ? Or, as she lay each night, wearyand footsore, by her baby-sister's side, howmuch dearer it became for the very effortsshe made for its support ? But the childhad a face that helped her: innocenceand truth were written there; and.many a passer-by, struck with the fairpage, turned back to give her moneyand a few kindly words. 62 MURIEL'S DREAMLAND.them far on high, and in descendingthey were dashed violently against somehard substance. He clung to it with des-perate tenacity, and held on firmly. Waveafter wave rolled over him, but yet heclung, until a lull in the storm gave himan opportunity of looking around. Thelightning was still his friend, and revealedfurther on many rocks piled around, show-ing that land had been gained. Afterresting for awhile, he made another effortto push forward, and succeeded with des-perate exertion in reaching dry land. Fora moment he sank exhausted and faintingon the sand; but his brave heart wouldnot allow him to give way when a fellow-creature's life depended on his exertions.